A fundraising page to deal with the aftermath of a fire than killed 12 horses has raised over £20,000. 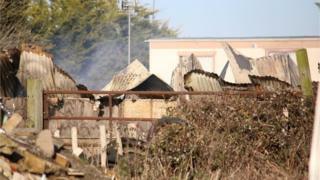 The blaze at Elmwood Equestrian Centre in Burnham-on-Crouch, Essex, started shortly before 23:30 GMT on 3 December. Many other horses were saved by passers-by who saw the fire, thought to have been started deliberately, and ran to let animals out of other buildings. The organiser of the fundraising page, Alex Longhurst, said they had raised "more than I ever expected". "This just goes to show, although there are some heartless people in the world, there are far more people wanting to help Elmwood get back on their feet," she said. "Rest in Peace Archie, Willow, Diamond, Gizmo, Rex, Priya, Rio, Minnie, Zinny, Murphy, Poppy and Alesha," the page said. Essex Fire and Rescue Service, which sent seven engines to the scene, said its investigation had shown the fire was "mostly likely started deliberately". The police were now dealing with the investigation, the service said. The money raised from "one group of horse lovers to another" will be used to "replace what has been lost, help towards shelters for the horses, and even vets bills", the page says.